Air planning is a key factor when it comes to planning a dive. Do you just go diving and assume you have enough air for the dive or do you take a minute and plan... we hope it is the later. Remember your maximum dive time will vary with cylinder size and dive depth. Its the answer to the following questions. How much air is in my Scuba cylinder? How long will that last me during the dive? Do I have enough reserve air for my buddy? ​How much air is in my Scuba cylinder? To calculate the amount of air in a cylinder you multiply your cylinder size (litres) by the cylinder pressure (Bar). The next figure you need is your Surface Air Consumption (SAC) rate. Your SAC rate is how much air you breath during 1 minute while on the surface, usually while doing gently finning. If you do not know your SAC rate, then assume a value of 25 litres per minute, but do not rely on this figure.. use previous logged dives to calculate your SAC rate OR if your computer is downloadable to a supplier piece of software, download and use the application, which in most instances will calculate and show you, your SAC rate. 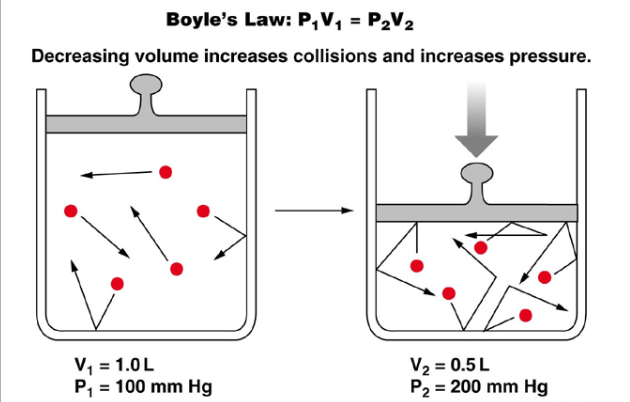 Boyle's Law states "For a fixed amount of an ideal gas, kept at a fixed temperature, pressure and volume are inversely proportional." For every ten meters of descent the pressure increases by one atmosphere absolute (ata or atm). Therefore total lung volume during a breath hold dive at ten meters is half of what it was at the surface. At 20m it is one third, at 30m it is 1/4, at 40m it is 1/5. When a diver surfaces or ascends these figures are reversed. But when breathing compressed gases, as in scuba diving, the mass of gas in the lungs is increased to fill the normal volume. ​An ascent to the surface without exhaling would cause the air already in the lungs to expand further, but with minimal capacity to do so. If a diver rushes to the surface with full lung capacity at 20m the lungs would expand a further three times normal with the largest pressure change of all happening at the last ten metres when it would double. We spend 20 minutes at 30m, how much air do we use? We ascend from 40m to the surface at a rate of 10m a minute, how much air is used during the ascent if we ascend at a rate of 10m a minute? While the above method is probably good enough for most people, there is a more accurate alternative. We calculate the depth half-way between the bottom and the surface and use that pressure instead. So, as you can see, we still has over 1,000 litres of air left (thats 77 Bar in a 15L cylinder). While the above method tells us how much air a diver will use, what we really want to know is how long will my air last. We now know how to do all the calculations that will let us answer this question. A diver explores a 20m deep wreck. If he has a 15L cylinder filled to 210 Bar, how long can he spend on the dive? That may look complicated, but that is mainly because I have shown you the full workings out. Once you get the hang of it, air planning is actually fairly simple. Before we end I should point out that we have only covered basic air planning. If your dive involves decompression stops, then you will need to carry additional air reserves.